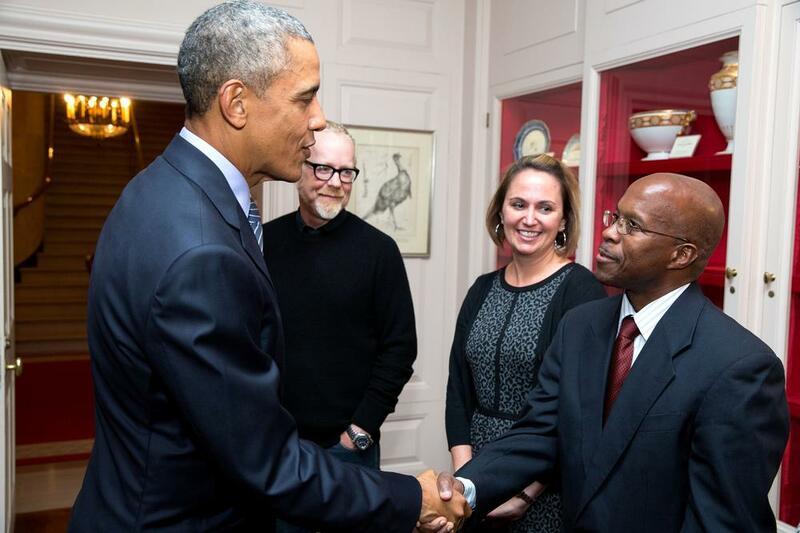 President Barack Obama hosted a legendary meeting in the White House China Room and celebrated an esteemed Hampton University professor, Dr. Paul Gueye, for his prolific contributions to diversifying the field of physics. Dr. Gueye, Assistant Professor of Physics in the HU School of Science, and President of the National Society of Black Physicists, traveled to Washington D.C. to attend the second White House Astronomy Night held on Oct. 19, 2015. “It is fitting that Dr. Gueye, a celebrated nuclear physicist, is being recognized for his continued efforts to increase opportunities for minorities and women in physics,” said HU President Dr. William R. Harvey. 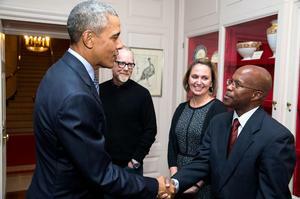 Gueye, accompanied by other top innovators in the field of science, was invited to a pre-event meeting with President Obama. Accompanying Dr. Gueye at the meeting was Ms. Ava Patino, a member of the PING2015 student class. Physicists Inspiring the Next Generation (PING) was launched on February 27, 2014, during the "Week of Action: Celebrating STEM and Black History Month" and organized by the White House Office of Science and Technology Policy. “I was very proud to represent the Hampton University community, the NSBP and the physics community. I know PING will only grow bigger and become a premier program. All of this would not have happened had I not been at HU,” said Gueye. PING, a joint initiative between NSBP and the National Radio Astronomy Observatory, is managed by Associated Universities, Inc. Its mission: to encourage pre-college students, especially traditionally underrepresented minorities and girls, to pursue careers in physics and astronomy; as well as to expose our community to these educational resources in order to inspire the next generation. PING’s unique educational experience utilizes a pre-college mentorship program where undergraduate and graduate students from Historically Black Colleges and Universities (HBCUs), lead middle and high school aged students through challenging undergraduate research, while gaining exposure to federally funded national laboratories and users facilities. The accelerator, nuclear and medical physics groups moved in a newly constructed Biomedical Research building in the Fall 2014. Three rooms were allocated for these groups since they have historically shared equipment, students and postdocs. They consist of a 74ftx25ft large space (equipped with a centralized multi-gas system, a water cooling system, a fume hood, several drop-down power racks and wall mounted work benches), a 22ftx42ft medium space (equipped with a gas system and wall work benches), a 11ftx29ft small space (as a dedicated computer research room) and a mid-size conference room. The building houses up to 600 kW as well as an external generator.